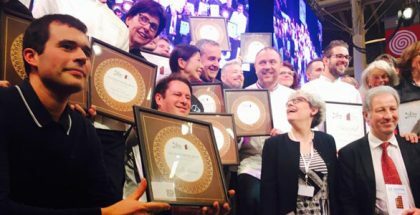 The long list of winners of the International Chocolate Awards was revealed last Friday, 14 October in London within the framework of The Chocolate Show. The judges, made of members of the Grand Jury and international judges, as well as local chefs, journalists, bloggers, and chocolate specialists, awarded gold, silver and bronze medals in numerous categories. The “Best in Competition” overall winners were the French family owned company Bonnat Chocolatier, currently run by Stéphane Bonnat who thoroughly monitors the origin and quality of the grains, who won for the Selva Maya bar in the Plain/origin dark bar category. In the Plain/origin milk bar, the small batch bean to bar chocolate workshop Fruition Chocolate, located in the Catskills Mountains of New York, won for their Marañón Canyon Dark Milk 68%, made from pure Nacional cocoa beans from the remote Marañón Canyon of Peru.